Ahh, New Zealand, the home of the All Blacks, land of Hobbiton, and a traveller’s dream. 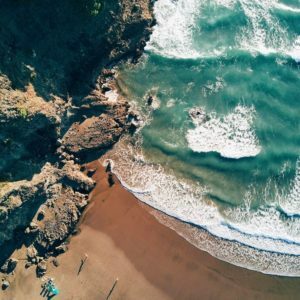 There are countless experiences to immerse yourself in while visiting this vast and natural wonder, but there’s something that you definitely can’t afford to miss…their beaches! 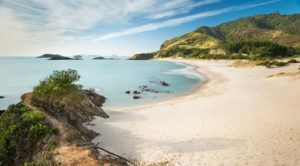 So, get your togs and jandals on (Kiwi for “swimmers and thongs”) and head down to these shorelines! 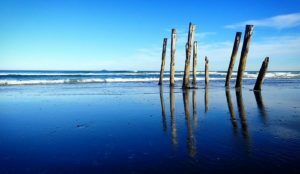 This beach is roughly 45 minutes west from Auckland city, and is a definite, local favourite in summertime! Take a walk on the pristine black sands, or try your hand at surfing and abseiling. If you want to connect with mother nature, there are several tracks that lead into the native forest, with a wonderful waterfall to greet you. To top it all off, in the local village you’ll find the surf club which has a bar and restaurant. It’s a perfect way to watch the sun go down in New Zealand! A 30-minute drive from the Peninsula with spectacular views of the harbour and volcanic rock from Mt Manaia, you’ll meet Ocean beach. A sunbather’s delight with its almost white sand and jaw dropping landscapes. Let your inner child out by climbing the sand dunes and feeling like a king (or queen!) of the world. This beach is perfect for a chill-out session, and a relaxing swim. A must for those lazy days. Hot tip: Bring a shovel! 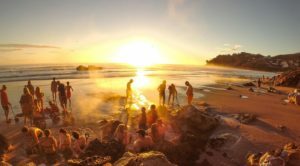 This beach has the locals and “those-in-the-know” flocking to the shoreline to take advantage of their own personal natural hot springs! The water is full of healthy vitamins and minerals such as calcium, magnesium and potassium, so make sure you get your daily dose, thanks to mother nature. Sadly, all good things come to an end, and when the tide comes in, your personal nature jacuzzi will disappear, but the memories will stay forever. 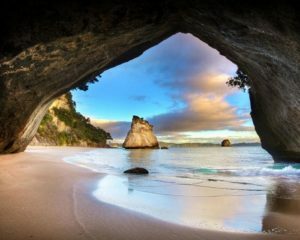 A 40-minute hike from Hot Water Beach is Cathedral Cove, and it just speaks for itself. Nestled behind unique rock formations and proudly boasting creamy white sands, this beach is an Instagrammer’s best friend. Swim, frolic and bring a picnic because won’t want to leave. 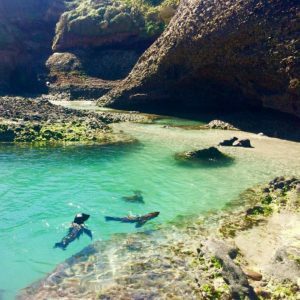 The Coromandel also has hotspots for fishing and diving so bring your snorkel and fins! Mission Bay bustles with vibrant restaurants, bars, cafes and ice creameries. It’s the metropolis of beach life. Not too far from Auckland’s CBD, you’ll be sure to see people swimming, sunbathing, playing games, having picnics and even paddle boarding or kayaking. Best way to spend the day with an ice cream in hand and your favourite music whilst letting the day escape you! Despite its name, Ninety Mile beach is 88km’s long. Nonetheless, it holds ninety miles’ worth of spectacular views and memories. This beach is perfect for 4WD vehicles only at particular times of tide. (Unfortunately, you can’t take our sweet rides on this beach!) for those that are into their fitness or just want to witness natural wide open spaces where land meets the shore, this is your beach! This National Park is New Zealand’s smallest, but has one of the biggest personalities. There is always something to do, see and experience here. 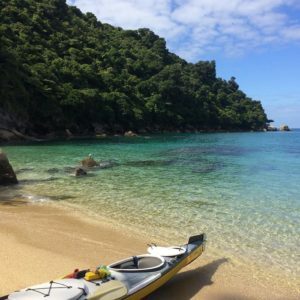 Sandy beaches are perfect to go canoeing, snorkelling, swimming and paddle boarding. If you want to adventure, take one of the many tracks into the native forests and stumble upon crystal clear streams that tumble down mossy valleys to join the ocean. You will meet wonderful native wildlife such as the Tui and Bellbird. Little blue penguins are found diving into the sea in search of their next meal and fur seals sit among the rocks, especially near Tonga Island. Do yourself a favour and go and get lost in this adventure! A renowned surfing location, St Clair beach is the main swim spot in Dunedin and is only minutes from the main town. There is plenty to do here! Hitting the bars and clubs, eating at quiet cafes or bustling restaurants, or getting that perfect insta-pic of the old pier posts, that still sit hauntingly in the sand. St Clair beach has a lot to offer, it all comes down to your imagination! Park your rental at the end of Wharariki rd, and prepare for the awe-inspiring farm walk in western Golden Bay, to the beautiful Wharariki beach, where monstrous sand dunes and rugged rock formations are abundant. If you follow the markers along the way, you will find Cape Farewell, where playful seals enjoy their days swimming and taking in the sun (bring your camera!). Because the sea is quite unpredictable, this beach is more suited for walking and dipping your toes in. Always make sure you assess your surroundings for an experience you’ll never forget. Nestled just 10km from central Christchurch, the lively and breezy seaside suburb of Sumner is 100% a water lover’s paradise. With plenty of space to swim, paddle or surf with lifeguards in the summertime, there’s plenty to do on dry land as well. You can go shopping in the little boutiques that line the boulevard or have a bite to eat in a cosy café. A definite must see! Now the best way to reach all these gorgeous beaches is of course by campervan. Look no further than Travellers Autobarn to get you to your New Zealand bucket list destinations. Grab yourself a quote today!